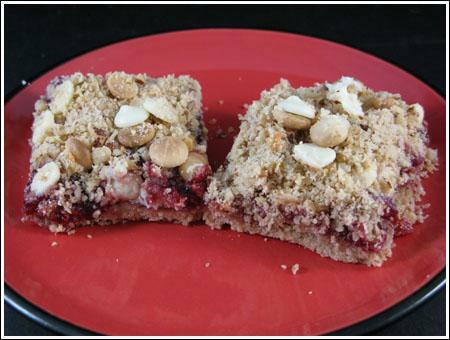 Today’s Raspberry Streusel Bars recipe, or at least the original version, is from Jeanne Jones. I got it from my friend Shirley who made it a few days ago for a healthy living group. Their topic was “Food” and for an activity they all brought in lightened dessert recipes. The raspberry bars were Shirley’s contribution. Shirley adjusted Jeanne’s recipe slightly – a bit more butter, a bit less white chips. All adjustments are reflected in the nutrition count, which I got from Mastercook. Even with the extra butter, the fat still comes in around 34%. Not bad for something so delicious. I used Ghirardelli White Chips. They tasted great, but they did brown quite a bit so I sprinkled some fresh white chips over the bars after taking them out of the oven. Looking at this picture, I’m not so sure that was a good idea since some are brown and some are still bright white. Next time I’ll just sprinkle more streusel over the chips to shield them a bit from the heat. These Raspberry Streusel Bars have slightly less fat than other versions. Preheat the oven to 350 degrees F. Line an 8 inch square metal pan with nonstick foil. Lay the almonds on a cookie sheet and roast them for 5-7 minutes or until lightly browned. Remove from oven and let almond cool. Keep oven at 350. In large bowl (or food processor) combine oats, flour, brown sugar, baking powder and salt. Combine butter and water; add to flour mixture. Mix until crumbly. Reserve 1 cup of this mixture and combine it with the cooled, toasted almonds. Press remaining mixture into bottom of prepared pan and bake for 10 minutes. Spread the raspberry preserves evenly over baked crust to 1/4 inch of edges. Sprinkle the streusel mixture and the white chips over the fruit spread. Return to oven and bake for 25-30 more minutes. Let bars cool before cutting into squares. Per Serving (excluding unknown items): 221 Calories; 8g Fat (33.6% calories from fat); 3g Protein; 34g Carbohydrate; 1g Dietary Fiber; 13mg Cholesterol; 128mg Sodium. Exchanges: 1 Grain(Starch); 0 Lean Meat; 1/2 Fruit; 1 1/2 Fat; 1/2 Other Carbohydrates. Colleen, you can add them to the reserved crumbs or sprinkle at the end. It’s up to you. OMG I’m gaining pounds by just looking at those! Thanks for that info! I’m always on the lookout for cookbooks with nutritional info. Please post if you know any more good ones! Yeah. I block out with Ace of Base now.